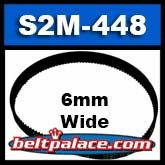 60-S2M-448 STS Supertorque Belt | Synchronous Belt 60-S2M-448 | Contitech/Bando S2M-448 x 6mm W.
Home > Synchronous Belts > One Sided Timing Belts (Single Side Synchronous Belts) > SuperTorque STS Timing Belts > S2M Supertorque Timing Belts. 2mm Pitch > 60-S2M-448 Synchronous belt. 60-S2M-448 Supertorque STS 2mm Pitch X 448mm Length X 6mm Width*. 224 Teeth. Replacement “STS Series” industry standard Synchronous Belt. Replacement belt for computer printers and power tools such as CNC Machines, woodworking tools & lathes, pumps, and robotic equipment. Printer Synchronous Belt 60-S2M-448 - (Metric Standard). Contitech/Bando S2M-448 x 6mm W Synchronous belt. *ONE LEFT IN STOCK. ORDER MORE BELTS AND THEY SHIP IN 2-3 BUSINESS DAYS.